Ernest Hemingway seemingly has bars named after him all over the world. You can't visit a city in Europe where the famous writer seemingly didn't write the great novel on that very bar stool. I challenge you to google the words "Hemingway Bar" and see if one pops up in your very city. These bars range from pricey joints like in The Ritz in Paris where drinks can cost upwards of $30 or dive bars run by college student where all your drinks will cost $30. 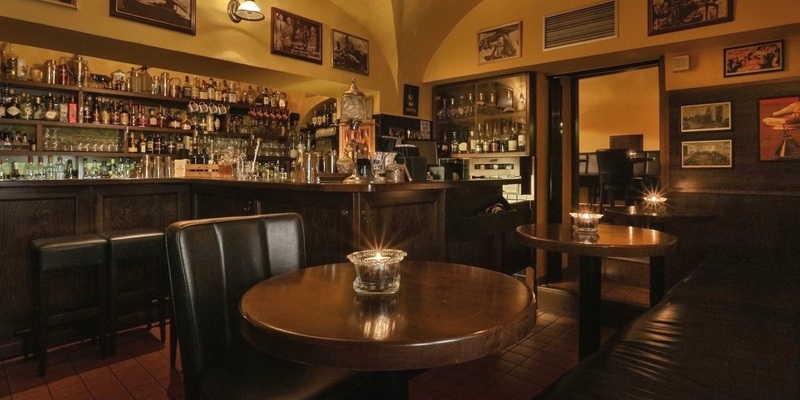 Lucky for us, the Hemingway Bar in Prague is a real gem! While the drinks don't cost a fortune, the atmosphere looks like they would. 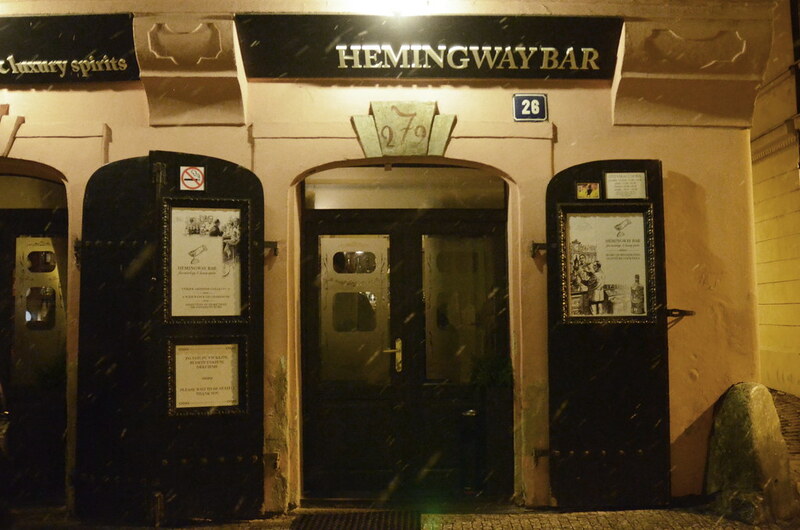 The Hemingway Bar can be found down a quiet cobblestone side street, below an unassuming door front. Stepping inside, the first thing you'll notice is how dark it is. The bar is made from a deep brown shade of wood, and dark leather bar stools and sofas dot the interior. Pictures of Hemingway decorate the walls along with old bottles of liqueur from times gone by. The interior is dimly lit with candles scattered about, reflecting gently off the low ceiling. Ernest Hemingway was a drinker, in addition to being a great writer. Perhaps the two go hand in hand. But being a seasoned drinker, he knew how to make a good cocktail. So much so that he perfected many a recipe throughout his time and now has a few drinks named after him. The most famous being the "Hemingway Daiquiri". 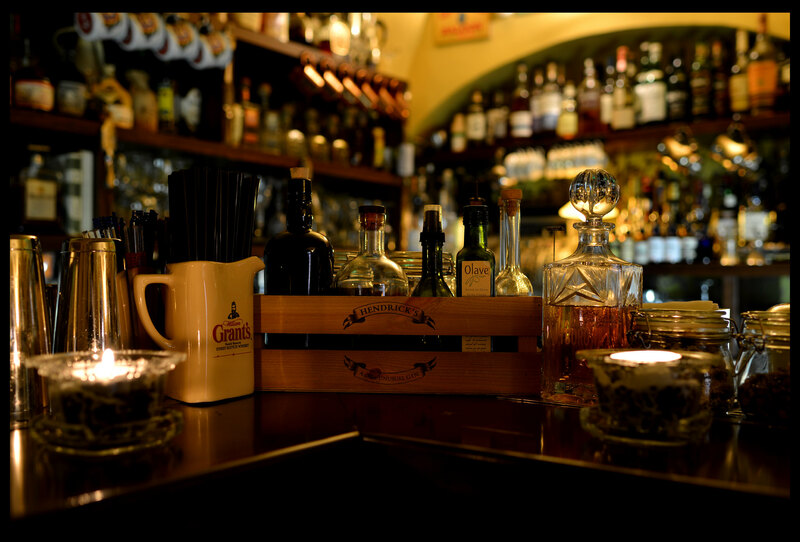 But here in Prague, the most popular thing to order here at Hemingway Bar are their extensive selection of absinthe, rum and Champagne. Cocktail gastronomy is an art here. 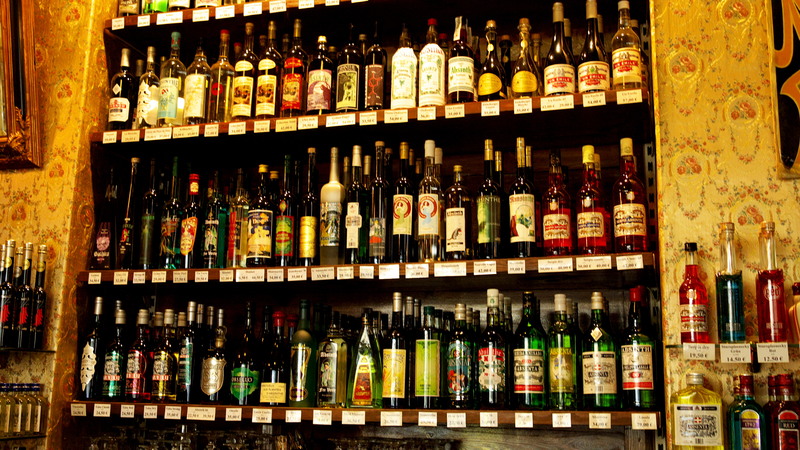 Their ample selection of rum is one of their highlights. You can even order an entire flight of small portions to sample a little bit of their collection. 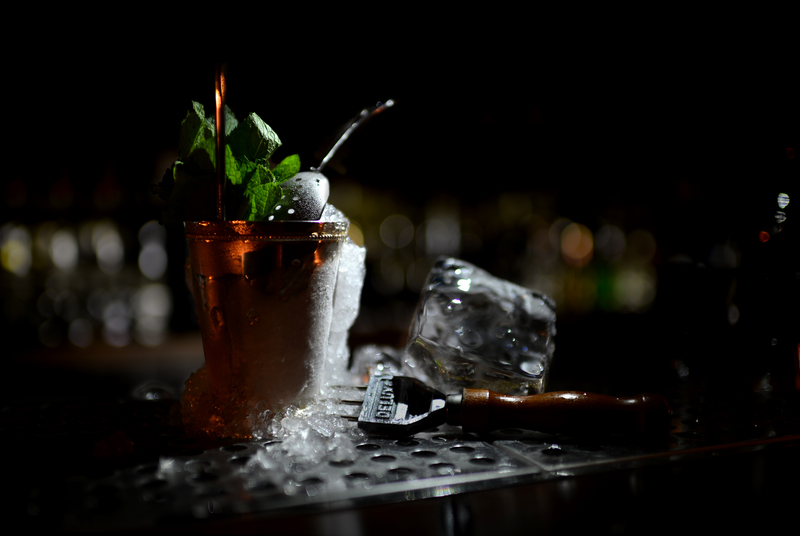 You can also have any of the bartenders make something special just for you using a few of your favourite ingredients. The bartenders here are shockingly friendly. At popular places like this, you expect the staff to be stand-offish and annoyed with tourists, but they could not have been nicer and chatted with us throughout the evening about their home town, life in Prague and regaled us with many Czech stories. The collared shirts and suspendered uniforms bring old world charm back to 21st-century. Sitting by the bar is the best place to be. Not only does it give you the chance to chat it also lets you watch the bartenders do their stuff. Study them as they effortlessly grab bottles from the bar without even looking at the label and concocting various potions in beautiful cups. The Hemingway Daiquiri is one of their most ordered drinks and consists of fresh lime, pink grapefruit juice, a dash of syrup, maraschino, and 13-year-old-rum and only cost 115 CZK ($5 USD). Other house specialities are Gin Fizz and their famous Old Fashioned. The best part of their cocktails is they are both imaginative, expertly executed and yet reference the traditions culinary history. Hemingway was also famously a cigar lover, and the bar offers up an array of cigars for you to enjoy along with your cocktail. Dan ordered a Cuban, and the bartender expertly cut and lit it for him, along with passing him a vintage ash tray. It did feel like stepping back in time, the heady smell of tobacco in the air and the sound of ice rattling in thick glass tumblers. The bar's ventilation is as old as it looks, so the smoke hangs in the air. If you're sensitive to this, you might want to take a pass on this bar. There is a small non-smoking section upstairs but it's not separated by any walls, so there will always be some carryover. 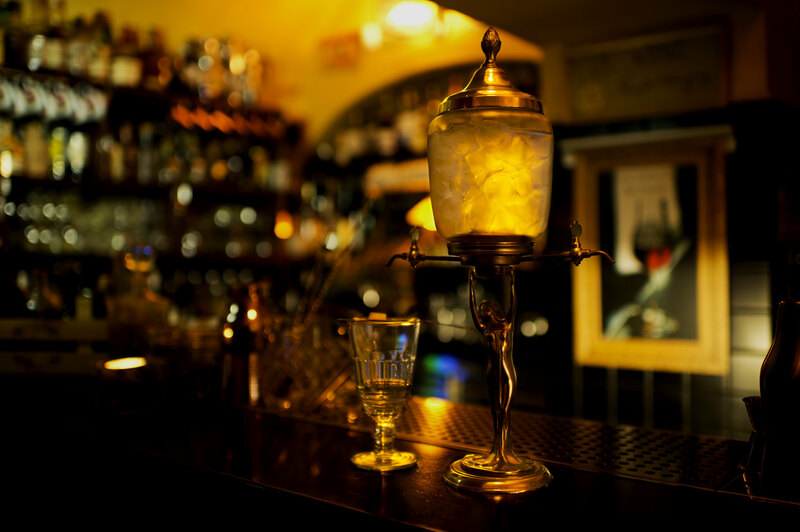 Hemingways specialises in exceptional absinthe. They carry hundreds of varieties and even have synthesised replicas of historic ranges. The bartenders here are kind and generous with their time to help first timers properly experience how to drink absinthe. Absinthe is an anise-flavoured spirit derived from botanicals, including the flowers and leaves of Artemisia absinthium (otherwise known as Wormwood) mixed with green anise, sweet fennel, and other medicinal and culinary herbs. The reason it has that iconic green colours is due to all the herbs inside. 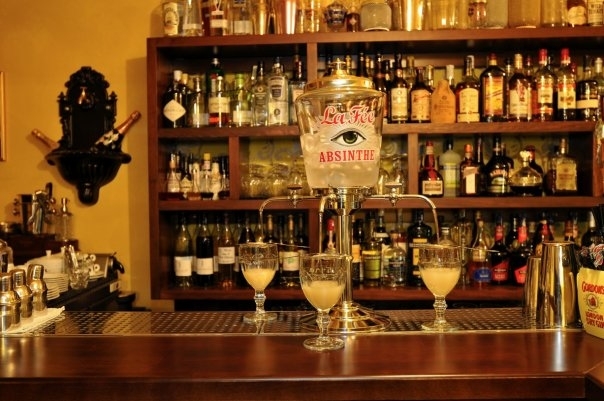 To drink it properly you'll need an Absinthe Fountain. Hemingways had dozens of original glass Absinthe Fountains which are beautiful works of art and heightens the drinking experience. The fountains are essentially a decanter filled with ice-cold water and the proper mixture of absinthe and water. The fountains have multiple spigots which slowly (and hands-free) drip the mixture down, over a silver slotted spoon with a sugar cube on top. The slow drip over the sugar cube allows the flavours to "blossom" in ways they could not if they were poured straight over the sugar all at once. The spoons and glasses are all different and little historic treasures. 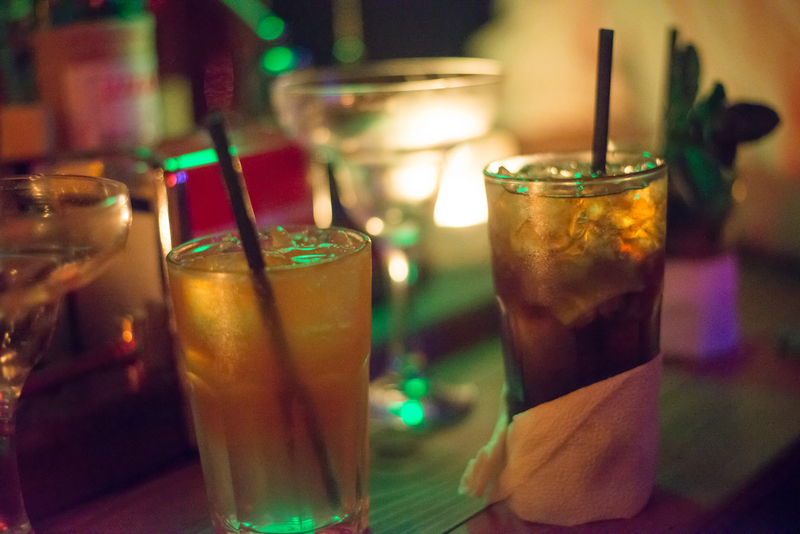 This bar is th perfect place to spend an relaxed evening after wandering this magical city. Don't miss it!